"When you are surrounded by vultures, try not to die", goes the Ivorian proverb, a touchstone for many post-colonial Africans. Changing the perspective somewhat in light of the unnatural longevity of Africa's leaders, I've been pondering the survival tactics of these scavenging creatures that have been our omnipresent companions. 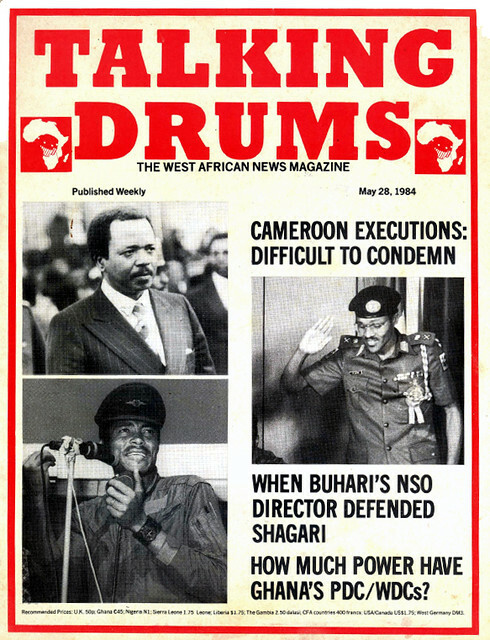 Cast yourself back to the middle of one of those lost decades in Africa and consider a magazine cover from 1984 featuring a representative trio of the time: Biya, Buhari and Rawlings. These names are still in the news thirty years on, but their paths have diverged. Most have stayed true to authoritarian form - albeit pretending to shed skin on occasion, and yet some have been reformed. Mitterrand, Thatcher, Gorbachev and Reagan have passed on but their African contemporaries have endured. What accounts for this tenacity? If the initial frame was the good, the bad and the ugly, something more elemental proved a better fit. 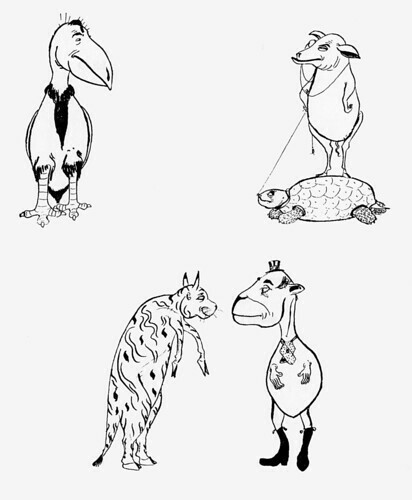 Consider the following as fragments of an African leader bestiary of sorts. Muhammadu Buhari is the exemplar of reform and reinvention. 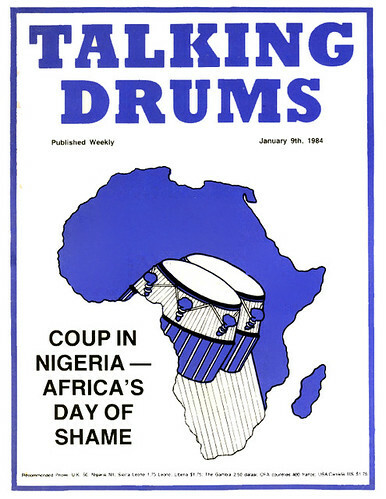 In his early career, he was an unabashed coup maker, repeatedly stopping Nigeria's nascent though imperfect democratic experiment in its tracks (1966, 1975). A severe military man, he came out of the shadows as head-of-state leading the December 1983 coup that ended the Second Republic. His mantras, such as they were then, were all about cleaning house, stopping Shehu Shagari and company's corruption (although the military proved in practice to be the most vicious and corrupt actors in the country's history), and most notably, a War against Indiscipline. He would be later be memorably satirized by Fela (who he imprisoned) as a Beast of no Nation. "My people are useless, my people are senseless, my people are indisciplined". The tumult that the grim-faced military put the country through under Buhari is not remembered with fondness by anyone, even if what followed (Babangida, Abacha) was perhaps more catastrophic in economic terms. These stronger, and more venal, predators stepped into his opening and overthrew him in short order in 1985. This was a rather friendly palace coup - a disagreement among wolves as it were, and he wasn't liquidated. Licking his wounds and withdrawing from the fore of Nigerian political life, Buhari was able to craft a second life. There has been reform and, with the passage of time, and three attempts (in 2003, 2007 and 2011), Nigerian democratic hopes, long disappointed in the intervening three decades, were pinned on him and his party in the 2015 presidential elections. There was no one Road to Damascus moment, but rather a pragmatic adjustment to multi-party democracy, the man calls himself a "converted democrat". The Nigerian political machine has accommodated him as much as he has accommodated the system. Given how large Nigeria looms in African fortunes, one prays for success of this experiment. 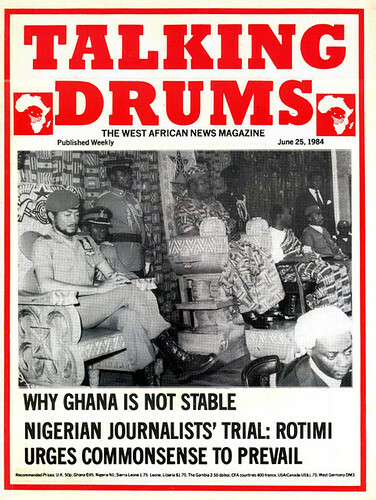 J.J. Rawlings had his two coups and 18 years in power in Ghana, ostensibly shedding his military uniform after a decade in 1992, and handing over to himself in a couple of shrewdly rigged elections to bring in the millennium. Dictator-no-more was the story although the authoritarian instincts persisted during the 1990s even in his civilian guise. The thin reed of political relevance that he stands on these days is making the occasional unreflective pronouncement about the probity of others, all the time hoping that no one confronts him about the bloodshed he amnestied his regime for. Surely the best indicators about Rawlings' enduring legacy were the 16,878 votes cast for his wife in the recent 2016 presidential elections. A full 0.16% of the electorate still paid obeisance to unbounded vanity. By and large, Rawlings as a phenomenon is healthily ignored. Still, as befits spent, but still viable, carrion, there will always be the occasional discarded carcass of the Ghanaian body politic that he can feast on. His progeny, the NDC, had another bite at power, feeding at the trough of pork barrel politics for the past 8 years. But looting and purely transactional deal-making can't stand for long in a country as politically sophisticated as Ghana. For a cabal that originally proclaimed populism if not socialism as their ideological markers to be revealed as a pack of common traders, if not mediocre, wannabe oligarchs, ought to be humbling. That is, of course, only possible if they were capable of shame and the jury is still out on that. The real sadness about Ghanaian politics is that a healthy opposition is needed for democracy to thrive. And so we come to Paul Biya... What can one say? Well Monsieur Biya is having the last laugh - all at the expense of the Cameroonian people. It has been the most charmed life for the past 42 years, living most of the year in luxury villas in France, Geneva, Brussels and the like. Where some American presidents could golf their way while bombing others, insouciance a l'Africaine is really a quite rarified thing. 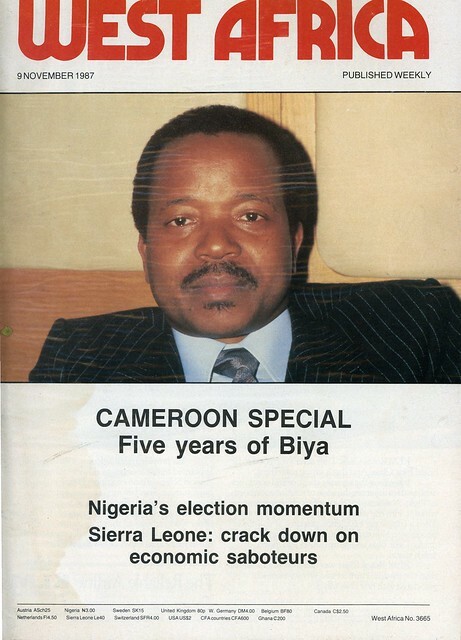 Like Omar Bongo, he didn't have to take up arms to remain Prime Minister or President. He wasn't a strongman per se, but one-party systems have their own logic. It has rather been the shrewd exercise of patronage politics and cronyism, his modus operandi is to buy everyone off and compromise everyone. He skillfully adapted to the veneer of elections and multi-party democracy that became obligatory with the donors after the changing winds of Africa 1989. 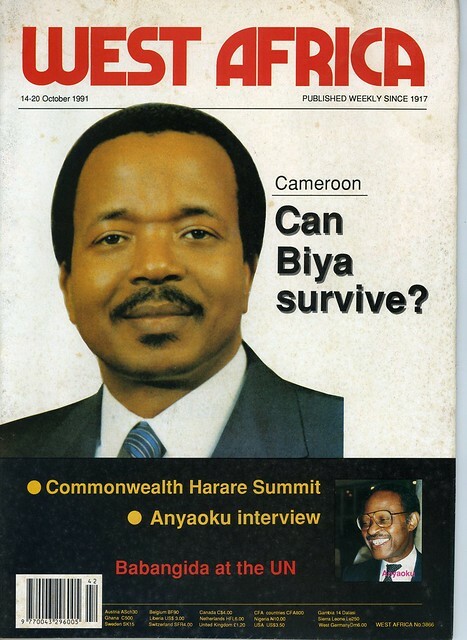 If five years of Biya was already enough in 1987, what could one say now, thirty odd years later? The danger, of course, is that a hollowed state could well be his legacy and, as with Bokassa and Bozizé in the Central African Republic, Houphouët-Boigny in Cote d'Ivoire, and especially Mobutu in Congo, we may still be picking up the pieces long after he is gone. Boko Haram, for example, may not be bought off as easily as recalcitrant French politicians. Sectarian and economic grievances long suppressed are fertile ground for opportunistic mischief. All it will take for Anglophone Cameroon, to take a recent troubling example, to explode is the rhetoric of the right populist. We have seen in our neighbourhood what a few bloody minded people willing to do their worst can do. The recent examples are not pretty. For too long the original sin in African politics was our colonial legacy and the external meddling. We can no longer blame Francafrique. Paul Biya's generational mismanagement proves that we were never innocent, indeed it is all sin. The definitive anthropological study of the bestiary of Africa rogues that have led the continent astray. The English translation is fine, we are all waiting for the wild animals to vote. logs in the eye or a nation?